Gazebo with two BBQs for your enjoyment. We stayed in the moose cabin and it was an amazing stay! Very clean. Location was perfect – shops and restaurants were within walking distance and it was only a short drive away from the park. Seamless experience and check-in/ check-out directions were straight forward. Welcome to Banff Beaver Cabins, a “Class B Alberta Heritage Site” and one of the earlier set of tourist cabins built in Banff. 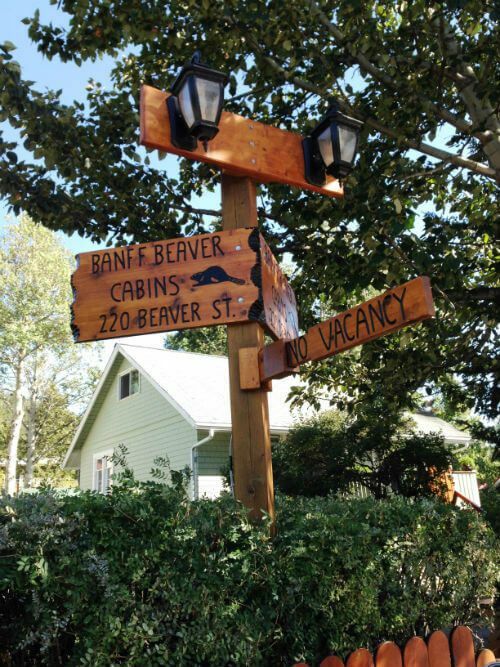 Situated in downtown Banff, one block away from Banff’s main street, our cabins consist of furnished, 1 or 2 bedroom cabins and suites, all with private bathroom, kitchenette and some with living rooms. Living and dining areas are comfortably furnished. The kitchens are well equipped, with all the amenities of home. Located within the heart of Banff, these cozy cabins are a peaceful refuge surrounded in panoramic beauty. Grab your morning coffee downtown or brew your own in your cabin and head up Tunnel Mountain, a 7 minute hike out your back door, to catch the breathtaking views and sunrise. Winter guests are within a quick drive or bus ride to world class skiing and riding at Mount Norquay, Sunshine Village or Lake Louise. All this makes for a fabulous vacation destination resort. Click here to learn more about the incredible history behind Banff Beaver Cabins. Click here for information about our stewardship and eco friendly beliefs and practices.